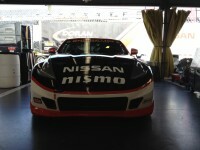 WATKINS GLEN, New York – June 26, 2015 – Doran Racing’s pair of Nissan 370Zs will start Saturday’s Continental Tire SportsCar Challenge race at Watkins Glen International at the top of the field in Row 1 and Row 2. In the Lebanon, Ohio-based team’s best qualifying performance so far this year, Brad Jaeger of Charlottesville, Va., qualified the #14 in second place, just 0.125 of a second off the pole with a time of 2:01.483 for an average speed of 100.755 miles per hour. Nick McMillen of Salem, Ore., will start right behind him in fourth place thanks to the 2:01.973 he posted during qualifying Friday afternoon on the 11-turn, 3.4-mile road course for an average speed of 100.350 mph. Jaeger was third initially, but then he set the second-fastest lap of the session on his third lap around the historic road course near Seneca Lake. Mission accomplished, he pitted after his fourth lap to save his Continental tires for the race, as did the third- and fourth-place drivers at the time. That gave McMillen an opportunity, and he seized it. Hampered at first by traffic and lying in seventh place, he advanced to fourth on his fifth lap despite it being his first event at this very challenging track. Doran Racing’s #14 finished second in this race last year, only 0.169 of a second behind the winner after 2.5 hours of competition. It started eighth last June. Both cars advertise Nissan’s popular GT Academy. Jaeger will start the race in the #14 and then hand it off to B.J. Zacharias of Cincinnati. Steven Doherty of Plainfield, Ill., is co-driving with McMillen here. The #14 was fifth in the first practice session and second in the second practice session prior to qualifying. The #41 was 11th and fourth, respectively. The 2.5-hour race is scheduled to begin at 12:25 p.m. tomorrow (Saturday). 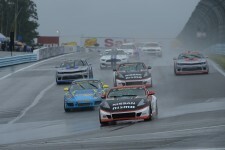 It will be broadcast live on IMSA.com. It will also air at 10 a.m. on Sunday, July 5 on Fox Sports 1. 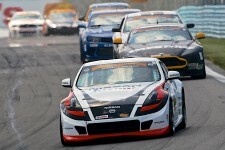 Brad Jaeger: “It was a wonderful qualifying session! The weather is perfect; it’s in the 70s, it’s sunny, and there’s a light breeze. It’s just an ideal day today, but it looks like it will rain all day tomorrow. “Considering that, it made Nick and my qualifying runs even more important. We’re starting in the front row and in the second row. Even if it rains, hopefully we’ll have decent visibility at the start and we’ll be able to check out and stay at or near the front, and then let the other two drivers bring it home with a victory for Nissan and Doran Racing. 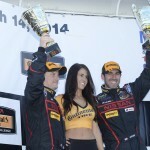 Nick McMillen: “Our car was good. I had a good gap at first, but then I was catching two or three slower cars and that cost me. On lap five I just caught one of the Mustangs, but I squeezed by him and ended up making it happen. It’s the best I’ve qualified this year to date.